One of my favourite uses for boneless chicken is Butter Chicken. If done right, this dish can satisfy, comfort, inspire, delight and sting. It’s magical. Truly. The secret to a dish like this is making it spicy and creamy enough to stand up to the fragrant nutty smelling jasmine rice it’s going to sit upon. When butter chicken and jasmine rice meet, my body and soul are nourished in a way I can’t quite describe. Place the jasmine rice in your cooking pot and run water over top up to three times to remove as much of the starch as possible (optional – sometimes I don’t even bother because I like starchy rice). With your hand, swish the rice around till the water goes cloudy, then drain it. Repeat this step two more times before measuring out your cooking water. With the rice and cooking water in the pot, heat the pot till the water starts to gently boil. At that point, drop the heat down to the lowest setting, lid the rice pot and set the timer for 15 minutes. After the timer goes off, lift the lid and place a small wash cloth the opening of the pot and then replace the lid before moving the rice off the burner. Set the timer for a final five minutes. The cloth is used to absorb most of the remaining moisture so the rice doesn’t remain mushy, but rather finishes in an almost dry and fluffy state. If the rice finishes before the butter chicken is made, it can stay in the pot off the burner till it’s needed for plating. Heat up your pan, and when hot, add the oil. Heat the butter until it foams up and then add the oil and heat through until a drop of water crackles when it hits the fats. Add the onion and saute until it becomes translucent. Note: I don’t like the stench of garlic on our breath, but if you like it, feel free to add some in the pan when you cook your onions. I would think one minced clove would do the trick. Add these five ingredients to the pan and heat through while you mix all of the dry spices together in a small bowl. After that, start pulling the chicken apart in to bite size chunks. Add the chicken to the pan and heat that up in the tomato sauce and then add the spices. After you add the spices, stir really well the evenly distribute the flavours. 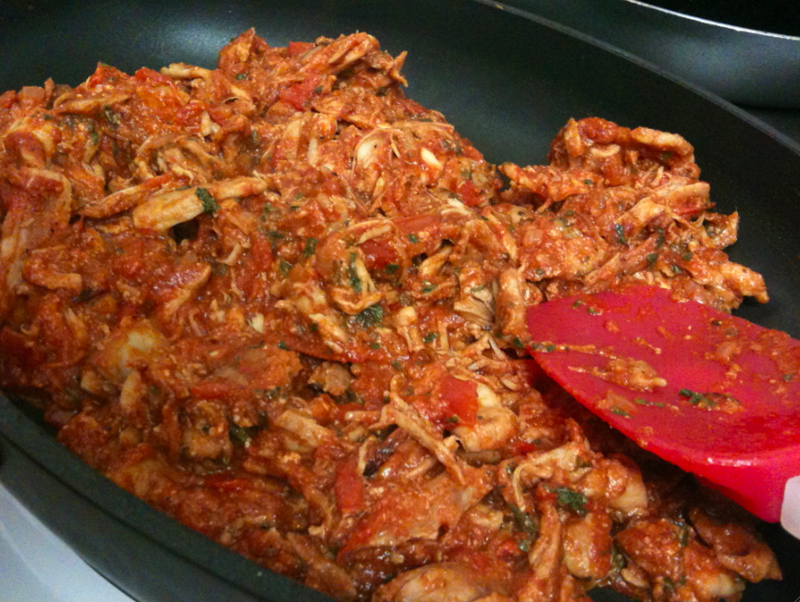 Stir inthe dairy to the pan to turn the tomato sauce into a creamy base that coats all of the chicken. Keep stirring until it’s combined fully. At this point, taste the sauce before you can finish the dish with a bit of salt (if needed). Now is the time for the final taste tweaks! Add some freshly parsley or cilantro leaves to give the final sauce and chicken another flavour, colour, and texture. Plate your jasmine rice into large shallow dishes (something with a small wall would be fine), and top the rice with one or two heaping scoops of your butter chicken. Serve this with toasted flat or naan breads in case it’s too spicy for some. Alt Plating Ideas: Steamed cauliflower for the warm naan, dry parsley for the cilantro (since only half of any given population like this herb), and mashed potatoes for the rice.